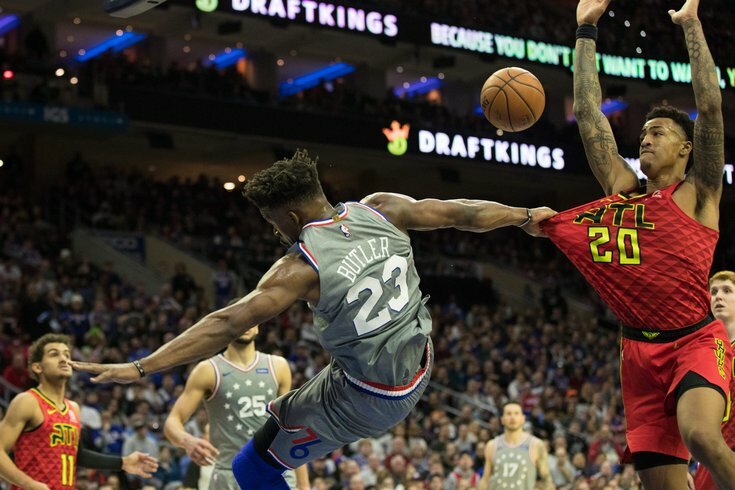 Philadelphia 76ers guard Jimmy Butler (23) grabs the jersey of Atlanta Hawks forward John Collins (20) while falling after being fouled during the fourth quarter at Wells Fargo Center. After a brutal loss to a bad Atlanta Hawks team on Friday night, the assembled media expected Ben Simmons to retreat into his shell. He's not much of a talker even in good times, and after losing to an inferior team, he would have been forgiven for wanting to get out of there as quickly as possible. But Simmons did something much more unexpected: he took his few minutes with the press to deliver a message that Philadelphia's defensive effort is nowhere near good enough. Sixers Mailbag: Will Philly make a big move before the trade deadline? "I think we were just too soft," said Simmons. "I just don't think we're physical enough. I think defensively we're not taking it personal enough when guys score on us. It should be a pride thing, when somebody scores you should be frustrated every time. I think that comes with age, we have a lot of young guys, but at the same time, I think we have to expect more from each other to get better and get to that next level. I know when playoff time comes, it's another level." "We have to take it as a challenge. You don't want to come out on the floor and have guys go at you every game, you want to make that a pride thing. Come out, get stops, and lock down your man. And that's everybody, including me." For those of you who don't follow the team closely, that's as much as I've heard Simmons talk in his career. He tends to save his longest answers for when he has opportunities to praise his teammates. Otherwise, he doesn't have much interest in the whole thing. But he had a lot to say on Friday night, which should let you know how pissed he is about their defensive toughness. He wasn't alone in this sentiment, and he wasn't alone in branching out from a typical postgame routine. Brett Brown tends to take his time after games before he makes his way to the press conference room, using his time to talk with players, go over a few important plays on film, or at the very least collect himself. But he emerged from the locker room quickly, and he didn't mince words when he had his opportunity to talk. "When I go back and I watch — as we do — the game in Washington, it was disturbing watching our bench guard, our young guys guard. And we have to get better. Opportunities for Jonah [Bolden] or Shake [Milton] or Landry [Shamet] or Furkan [Korkmaz], we're counting on them. We play them, they're in the rotations, that's our bench," said Brown. "It's hard to do, it takes time. And so there's got to be an element of patience from me, but it doesn't pivot me out of the fact that we had a hard time in Washington, and I saw bits of it tonight...it's not good enough right now. We need more, and I believe it's in them." And this, really, is the story of the season thus far. Joel Embiid and Jimmy Butler questioning their roles on offense has dominated the headlines, but the Sixers have been good on offense for most of the stretch since Butler was acquired. It's the other end of the floor where there are legit concerns, and there's not an overnight fix available. Without Embiid on the floor, the Sixers fall off a cliff on the defensive end of the floor. But that was true before the trade for Butler, too. The issue now is that the defense has gotten worse with Embiid on the floor, and remains not great in his absence. The gap has closed, but it's getting worse across the board. There are a lot of explanations for that — more bad defenders in the rotation, Butler adjusting to a new scheme (and being worse than the guy he replaced on that end), lack of depth — and none of them make you feel great about the situation. "I think a lot of the time, [Embiid] can come and save us and block a shot or alter a shot, and I think we rely on help just a little too much," said Butler. "No one person in particular, I just think everybody as a whole has to man up and learn to guard your guy. If we can stay in front of the ball, we don't have to worry about calling for as much help." What stings about Simmons' and Brown's and Butler's acknowledgment of the problem is that there's almost no clear path to improving it this season. They can't make Shamet and Bolden any older, any wiser, or even much stronger in the middle of the season. They can't make Mike Muscala any more athletic or less susceptible to being exposed in the wrong matchups. They can't make Amir Johnson any younger. This group is what it is. Philadelphia has limited means to improve on that group without compromising future flexibility. They can't package multiple players in exchange for one better one because they're already too thin as it is. Their most sensible player to trade, Markelle Fultz, has little present-day value and would be dealt at a tremendous loss compared to their initial investment. Even Wilson Chandler, who missed the bunny that ended Friday night's loss, is tough to justify trading with how few wings they have that can walk and chew gum at simultaneously. There may be more pain ahead for this team, especially with a daunting stretch looming starting next week. The Sixers will play a number of elite teams — the Thunder, the Rockets, the Warriors, the Celtics, the Raptors — over the next month, and they will get blitzed if they continue down their current path. In his final offering of the night, Simmons offered a pretty clear warning to his younger teammates. If you think things are tough now, wait until the big boys come to town. "Sometimes it's just in you. Sometimes it's one of those things where it's a pride thing, and sometimes you just have to build over time," said Simmons. "But you know, guys will start to realize once we start to play better teams and get to the playoffs."